VMware AirWatch Content Locker is a web-based private cloud storage system using the VMware AirWatch technology. The system, managed by OCIO and housed on the campus, allows users to access documents stored on the system from PC, Mac, iOS and Android devices. It provides a solution to sharing meeting documents in achieving paperless meetings. AirWatch Content Locker is accessible both on a web browser and via an app. Users can visit https://airwatch.eduhk.hk using a web browser and login with their network account and password. There are also native apps for iOS, Android, Windows and Mac which allow access to the documents with or without network connection (offline mode). Committee secretaries can upload meeting documents to AirWatch and share them with members of the committee (by setting access rights) using a web browser or a native app. Members just “Bring Your Own Devices (BYOD)” to the meeting for viewing the documents using either a web browser or a native app. With a native app, they can select files to be downloaded on the device for offline reading when there is no network connection. Each staff is given 2 GB disk quota. Due to limited resources, users are recommended to clean up the files on AirWatch regularly. Besides, students can only read the shared documents with access rights granted. They cannot upload documents to AirWatch but they can use Google Drive or O365 OneDrive for file storage. We recommend meeting secretaries to login the AirWatch web client (https://airwatch.eduhk.hk) using a web browser for folder management, document upload and access control. For meeting attendees, they can use a web browser to access the shared documents but to do so they will need a network connection. 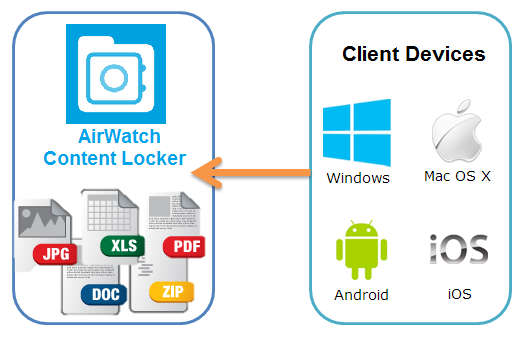 For detailed instructions, please download AirWatch Content Locker web access user guide. Besides viewing the shared files on AirWatch using a web browser, mobile device users can also install “AirWatch Content Locker” app available on Apple App Store (iOS) and Google Play Store (Android). One benefit of using the native mobile app is that it supports offline mode such that users can select files to be downloaded on the device for reading when there is no network connection. VMware provides a client software - Content Locker Sync - for installation on computers running MS Windows and Mac OS to access AirWatch. Same as the native apps for mobile devices, Content Locker Sync allows Windows and Mac users to download the shared documents for offline reading when there is no network connection. After Content Locker Sync is installed, a new folder "Personal Content" will be created. Documents in the “Personal Content” folder are synchronized with the shared documents on the AirWatch system (which is similar to Dropbox). 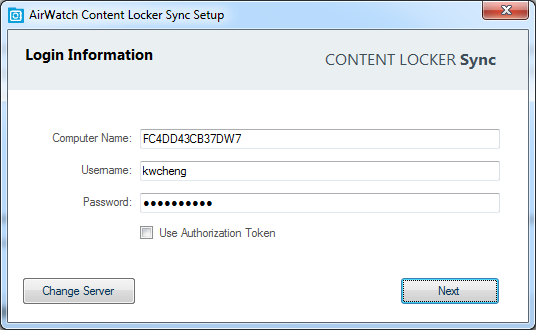 When you first launch the Content Locker Sync, it will prompt for login. Please enter your EdUHK username and password to proceed. Note: The AirWatch system is backed up daily for disaster recovery purposes only. We will not entertain requests for restoring individual files that are deleted. AirWatch is setup as a temporary storage to support paperless meetings. It is not a replacement for the current file storage systems such as your personal N: drive and DMS.